I'm jumping all over the place again and today I have Color Club's Lumin-icecent from the Foiled collection. This was a group of metallic colors that are very reminiscent of the China Glaze Khrome or Romantique collection. As with metallics, they will show every ridge or dent in your nail (if you have them like me!). I used a base coat of Zoya Get Even, 2 coats of polish and I decided to go without a top coat because I loved the shine that these colors produce on their own. So this was before a manicure - can you tell? My cuticles were horrible, especially my middle finger!!! I love the base color of this blue - it reminds me a bit of Zoya Crystal - without the gold. I'm not sure how I feel about metallics. I think they are pretty awesome but they are also awesomely shocking on the nail. I like the idea of toning it down with glitter, crackle/shatter or even some Konad. Indoors with a flash - kinda fail on this one. But at least you can see that metallic blue ... and a bad polishing job. Hah, seriously - fail Krystal... fail. 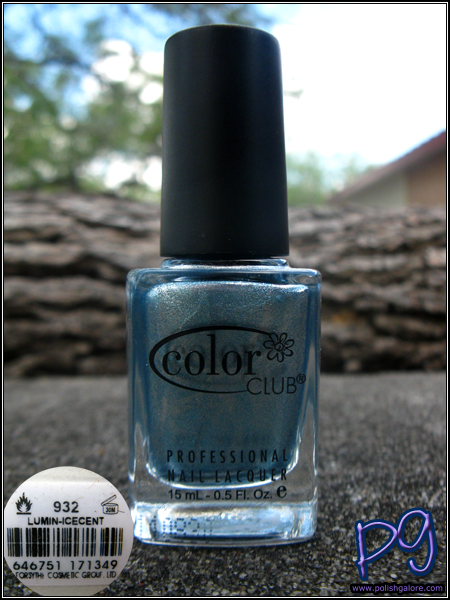 Color Club is located on several etailers, including Head2Toe Beauty which has it for $3.00. You can also Like them on Facebook and Follow them on Twitter. I really am in love with this collection I have heard that they are great to use for stamping, just like the collection you mentioned above are. Ready to try them! This is a lemming of mine, looks so nice!! The Painted Nail: Name The Collection! POP Nail Contest Entries & Winner!